Behind that adorable masked face lies a determined forager and a potentially destructive intruder. When it comes to dealing with wild animals, there are seldom guarantees. But if you're determine to get rid of raccoons on your property, you can do worse than start with the tips and tricks detailed here. Sure, raccoons are sort of cute, but know this: If it feels threatened, a raccoon can be dangerous, particularly if it’s carrying a disease (e.g., rabies). Tread carefully, and remember that there are professionals trained to deal with raccoons and other creatures. Your local government most likely includes an animal control department with field operations aimed at helping residents cope with wildlife. Of course, if you’ve been frustrated by repeated incidents or feel the need to get on the case immediately, continue reading to learn how to get rid of raccoons safely and effectively, whether they’re causing trouble under your roof or strictly outdoors. Raccoons are scavengers; if they’re hungry, even mere morsels of food left out in the open can lure them to your property. 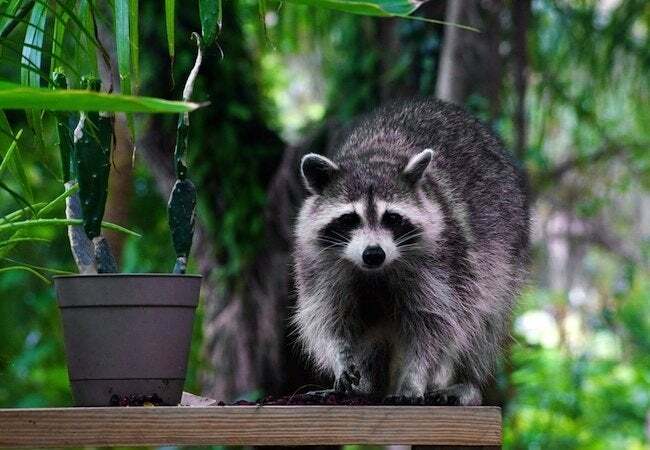 To eliminate a raccoon problem, therefore, it’s important to keep discarded food waste out of sight and to the greatest extent possible, contain or mask its odor. Purchase and use receptacles with lids that close tightly and lock into place. Additionally, consider double-bagging any trash that’s going to spend at least one night outdoors before your next scheduled garbage collection date. Any food—even pet food—left outside can attract raccoons. If you must feed your pets outdoors, feed them only at certain times of day, and remove anything uneaten. If you and your family like to cook and/or dine al fresco, always take the time to clean up afterward. Here, it’s well worth being thorough; as a precaution, hose and wipe down your picnic or patio table at the end of a meal. For best results, use a cleaner that contains bleach, a chemical that goes a long way toward vanquishing odors. Note that bleach works so well at eliminating food odors, you might even pour some over any trash bags left outdoors in a unsecured receptacle. While raccoons can make a real mess of your yard, strewing trash in all directions over a surprisingly broad radius, they can wreak even greater havoc indoors, endangering your family’s health and safety. To get rid of raccoons indoors, you may be tempted to use poison. Ethics aside, this may not be the wisest course to take, because if the poison works and the animal dies, you’ll be left with a noxious odor and a mess you surely won’t enjoy cleaning up—assuming you can even find the dead raccoon and that it’s in an accessible location. How do you make sure that raccoons get out and actually stay out? You must determine the animals’ entry point. 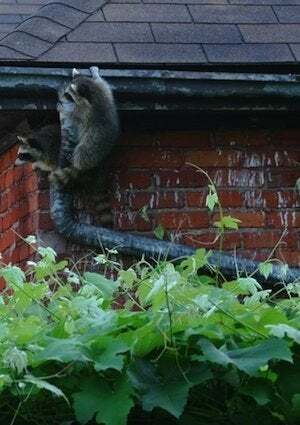 Typically, raccoons get in through the eaves of the roof or in openings at the foundation level. Once you’ve located the access point, the next step is to make your home inhospitable. Raccoons enjoy the dark, so a strategically placed flashlight can be a deterrent. Because they’re also put off by strange noises, playing a small radio may help keep them at bay. Finally, raccoons hate the smell of ammonia, so leave a saucer full of the stuff (or an ammonia-dipped rag) near the creatures’ entry point. Within 48 hours, thanks to one or all of the above tricks, the raccoons are likely to vacate the premises. Once you’re certain your visitors have left the building, the final step is to seal up the access points so as to prevent return. In future weeks and months, periodically walk your home’s perimeter to check for signs of a pest presence. Likewise, remain vigilant about securing trash bags and cleaning up after outdoor meals.